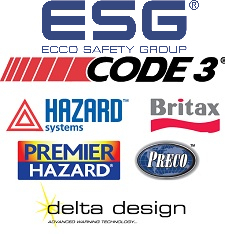 ECCO Safety Group (ESG) is a worldwide leader in commercial and emergency vehicle warning and safety products. ESG companies design, manufacture and market back-up alarms and amber warning lights for over-the-road and earth-moving vehicles and material handling equipment as well as lighting and sound-based warning products for emergency services vehicles used in law enforcement, fire, EMS, and security industries. ESG's product offering includes back-up alarms, beacons, lightbars, minibars, lighting systems, directional work lights, work lamps, interior and exterior vehicle lighting, traffic controllers, camera systems, sirens, amplifiers, speakers, and related accessories. ECCO was founded in 1972, in Boise, Idaho, where ESG’s headquarters and largest U.S. based manufacturing facility are still located. ESG grew internationally through the acquisitions of Hazard Systems in Australia and Vision Alert and Delta Design, in England. ESG expanded into the emergency and fire markets with Code 3, the St. Louis based emergency lighting division of ESG’s largest acquisition, Public Safety Equipment Company. The PSE acquisition also brought the Britax and Premier Hazard brands, both located in England. ESG currently operates over 450,000 square feet of manufacturing space across seven manufacturing facilities on four continents. Along with two additional sales offices in Europe, ESG employs over 800 team members. Globally, ESG serves more than 3,000 OEMs, private label, fleets and aftermarket customers in a range of vehicle industries.